CON-CRÉT is a pure, concentrated, pantent-pending creatine hydrochloride designed for serious athletes (both professional and amateur) and any fitness-oriented person who is looking to increase their conditioning level or gain a competitive advantage. CON-CRÉT is also ideal for anyone whose livelihood may benefit from an increase in the production of Adenosine Triphosphate (ATP), a major source of energy or fuel for cellular and muscular function, such as those on restrictive diets and are not getting enough creatine in the foods they eat. Unlike other creatines on the market, CON-CRÉT does not require a loading phase or the need to cycle-off, due to its bioavailability and recommended micro-dosing by body weight (only ¼ tsp or capsule per 100 lbs of body weight). A true scientific breakthrough, CON-CRÉT is the only creatine on the market that you micro-dose, with one serving being equivalent to 5-10 grams of creatine monohydrate. Unlike other creatines, CON-CRÉT does not cause any negative side effects, such as bloating, water retention and GI issues that most have experienced from taking other creatine blends. In a recent creatine uptake study by The University of Nebraska Medical Center and The University of Manitoba, CON-CRÉT proved to be the most soluble creatine on the market – with 60% greater creatine plasma cUoncentration in muscle tissue than creatine monohydrate, a benchmark of creatine studies for over 20 years. The most readily absorbed creatine form available, CON-CRÉT offers steroid-like results in strength, endurance and muscle recovery in a legal and safe natural product. Athletes can take CON-CRÉT and get superior results in performance without any worries of failing any form of drug testing – you will never be tested positive for any illegal or banned substances when taking CON-CRÉT. 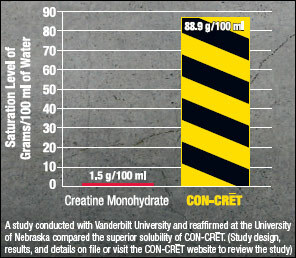 CON-CRET has superior solubility, uptake and potency -- greater than creatine monohydrate. 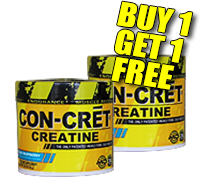 One serving of CON-CRET has a potency of 5-10 grams of creatine monohydrate. Can be safely used before, during and after any competition. There is no risk of failing a drug test supplementing with CON-CRET. CON-CRET is a pure and highly concentrated patent-pending creatine hydrochloride molecule. The CON-CRET advantage - One of the only creatine products on the market today that you can dose on body weight and workout intensity. Take 1 hour prior to workout or competition. Mix with 4–6 ounces of juice or water. Can take on an empty stomach or with food. Can mix with protein. No need to stack with other creatine products. Normal workouts (lasting one hour or less): 1 scoop per 100 lbs. Intense workouts (lasting more than 1 hour): 2 scoops per 100 lbs. Off days: take 1 scoop per 100 lbs. to assist in muscle recovery. As with any supplement product maintain adequate hydration. CON-CRET is not a steroid. It is safe, legal, and natural. CON-CRET is made in the USA and complies with cGMP.